Rogers and Out reports on a win albeit in vain, describing some magnificent performances with some blips on the way. On an interview earlier in the tournament, Paul Stirling described us as a '50/50' team and he went on to say that we would need to improve on this if we wanted to achieve any 50 over success. Sadly, despite the great man's three centuries in the competition this year, we remain a 50/50 team as a 33 run win at a very warm Nevil Road left us with a record of four wins and four losses, which was insufficient to make one of the top three qualifying places. In a game where three players made centuries, explosive batting from Eoin Morgan and Hilton Cartwright and an unbeaten 143 ball innings from Stirlo, which included 66 singles, propelled us to 322/3. Despite fine knocks from old boy Ryan Higgins and old enemy Ian Cockbain, we held on to take the spoils. We did not play in Bristol last year, with the 50 over game being at home and the T20 held at Cheltenham. So it was two years for me since last taking a train to Temple Meads and I arrived to find a large amount of construction and road works near the station. 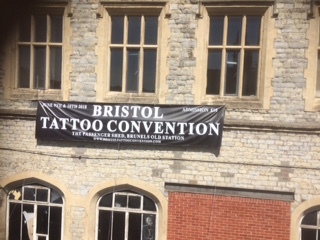 I also discovered that the Bristol Tattoo Convention is being held this weekend, which will, no doubt, be of interest to certain cricketers from Surrey and Somerset. On arrival at the ground, I was surprised to discover that Chris Dent had put us in to bat on winning the toss, despite the fine overhead conditions. There were two changes for us from the last outing. Dawid Malan and James Harris coming in for Stevie Eskinazi and Steven Finn. Ryan Harris opened the bowling for Gloucester and kept things tight initially to openers Stirling and Malan. In fact, he managed to hit a prone Mala on the head when attempting to run him out, but no damage was done and he sportingly made sure his former team mate was OK before returning to his mark. Our captain made just ten before falling to an athletic catch behind from Roderick off Higgo's bowling and when Gubbo played on to Chris Liddle for eleven, things looked decidedly dicey. Enter Eoin Morgan and he looked to be a man on a mission. With Stirlo happy to keep the score ticking over, England's white ball captain went on the attack and was particularly brutal to the slow bowlers. The rookie George Drissell was dispatched to the boundary on numerous occasions, and van Buuren fared even worse, going for three sixes in the 32nd over. Stirlo got in on the act too, lofting the usually economical Howell into the seats at the Ashley Down Road end and our Hibernian stars registered a very fine 158 run partnership. Eoin had just completed three figures when he was caught in the deep by van Buuren off Howell. His 100 came from 72 balls, with seven fours and five sixes. Our score was now 206/3 with just under fourteen overs left, so there was work to be done if we were to set a challenging target. It would be true to say that Hilton Cartwright has not exactly set the world on fire in this campaign. However, his batting today was even more explosive than that of Morgan and he regularly launched the ball into the pavilion area straight down the ground. Stirlo was still milking singles and his century was soon reached. In similar fashion to Morgan, he lobbed one up in the air after completing his ton, but this time, van Buuren made a complete hash of the chance and Stirlo made Gloucester pay, hitting four consecutive fours off Liddle's last over to ruin his figures. The boy from Belfast was unbeaten on 127, and Hilton's undefeated 60 came from 41 balls with two fours and five sixes. Gloucestershire needed 323 and started quickly, aided by some below par bowling from Tom Helm, whose first three overs went for 32 runs. James Franklin replaced him and struck with his first delivery, having Hankins caught and bowled. Helm soon made up for his bowling by taking a wonderful catch in the deep, running back and having to turn, to dismiss Howell off Franco. When Stirlo caught Dent off Harry and Hilton, aided by Simmo, ran out Roderick, Gloucester looked to be in deep trouble on 72/4. However, Cockbain and Jack Taylor started putting bat to ball and took a liking to our spinners, Nathan Sowter in particular. Nathan had the last laugh when he bowled Taylor for 33, but this brought Higgo to the crease. In a partnership of 128 with Cockbain, he played the aggressor's role and looked to be turning the game Gloucester's way. Bet365 showed Gloucester's odds tumble from 12/1 to 11/8, but we held our nerve and Tom Helm induced one big shot too many from Ryan, and his skyed shot was taken by Stirlo for a gallant 65. With Cockbain still there, Gloucester had hope but the remaining batsmen didn't do much. Wickets from Franco, Nathan and a couple from Tom, to ease the pain of his uneconomical figures, saw us home, although Cockbain did make a merited unbeaten hundred. So, another year goes by, and we fail to make the latter stages of a white ball tournament. Perhaps we should have a look at what the Second Eleven are doing. Six wins out of six in qualifying this season, and on a couple of occasions, winning against the odds (in the games at Kent and Sussex away) which is something the first team rarely do. Edited 1 time(s). Last edit at 2018:06:10:22:26:41 by BarmierKev. We always seem to start strong in this group set-up,have a little blip,and then become stronger again. So big hitting,that bought dividends in Bristol,and finished this tournament with a win. By the way..Construction work at Temple Meads is for the overhead electrification of the GWR,and roadworks are for some express bus routes to serve the city. We return in September for the county game,hopefully the same result. As usual with Middx "Too Little, to late!!! The players really need to take a hard look at themselves, if they wish to gain promotion this season. As for the team management there has been some very odd selection choices, bearing in mind their youth policy at the start of the season. Is Ryan Harris related to Dave Harris? Great report as usual. R and O. Bonuses. A win for the Middle and a lot warmer than Blackstone Academy. Good report and you make a good point re second eleven white ball cricket which has been good for a number of seasons. Recovering from 4 for 2 and 52 for 4 on Tuesday to total 282 being a case in point. Is Ryan Harris related to Dave Harris? Oh dear ! Andrew Hildreth last week, and now Ryan Harris. I blame Thatcher. Thatcher's Gold that is. We'll soon have a team of misnamed players. Four so far - the Harris brothers (Dave and Ryan), Andrew Hildreth and Aneurin Bevan. and I always loved the time the Gruaniad referred to Roll and Butter throughout a description of an innings by Roland Butcher. Result was never really in doubt, Gloucs always needing about 30 more runs than they had balls remaining, once Higgo went it was all over. Did you think Stirlo was injured? 66 singles in his hundred was most uncharacteristic and he seemed to hold his shoulder towards the end when finally lashing out. Did you think Stirlo was injured? 66 singles in his hundred was most uncharacteristic and he seemed to hold his shoulder towards the end when finally lashing out. I think he's been carrying a knock or two throughout the campaign. He was hit by the ball at both Cardiff and Taunton, but managed to struggle on. Having said that, running 66 singles is a fair achievement for someone with an injury. He was happy to keep it ticking over at Bristol, with Morgan and Cartwright providing the fireworks at the other end. Enjoyed the game very much, but it was a shame such a good performance was witnessed by so few Middlesex fans, notwithstanding the fact that we were highly unlikely to qualify. Yes I agree R & O about the lack of support - I heard many at Lords on Sunday saying they wouldn't bother because we couldn't realistically qualify. These are the same football supporters who follow their crappy teams the length of the country in the Premier League despite the fact from about mid September their team had no chance of overhauling Man City at the top - you gotta laugh! Don't let's kid ourselves about this result meaning anything. When the pressure's off, it's a whole lot easier to have a thrash at the bowling. I feel it significant that Cartwright scored runs in a game that didn't matter, yet his one over of rubbish against the Mexicans cost 12. I don't think he has the temperament or skills for the level he is being asked to play at, and he definitely is not the pivotal all rounder that would make both our batting and bowling more effective. We have failed to deliver AGAIN. We also do well when the pressure seems to be off - had we needed to win to qualify no doubt we would have thrown it away. Bit like a football team that is relegated and then win all their remaining matches! !